Howard asks, "I just recently noticed that in any of my picture or video clip files a (Data Base File) called thumbs has recently appeared. When I delete it, it reappears. It was never there before. I noticed it after a couple of updates from Microsoft. What heck does it do? It doesn't seem to effect my ability to see the img or mvi pics, etc." The default behavior for many folders in Windows XP is to display thumbnail images of the files in the folder. This is primarily true of folders created from digital cameras or filed under the My Videos and My Pictures folders. Thumbs.db is Microsoft's way of caching thumbnail images of any image or movie file in a folder. The idea behind creating a thumbnail cache is to improve the speed of displaying thumbnails the next time you open the folder by caching a set of thumbnails for the image and video files in the folder. If you hadn't seen this file in your folders previously it's likely you didn't have Show hidden files and folders enabled. Deleting the Thumbs.db file simply deletes that cache, which is regenerated the next time you view the folder contents. It is possible to configure Windows to never cache thumbnails. 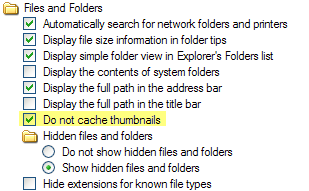 To turn off thumbnail caching, open Tools > Options in Windows Explorer and click on the View tab. Check the box next to Do not cache thumbnails and click OK.